On the basis of the statistical regularity the anthropogenic catastrophe risk evaluation criterion for units and components failure under operation has been developed. The paper contains both the analysis of possible failure reasons on the basis of an abstract unit as an example and the appropriate calculations of the criteria obtained. The investigations conducted allow to predict equipment failures of technical objects and to improve safety in their operation. When speaking about the problem of safety for power-consuming objects and particularly for the airspace ones one can’t but admit that the successful solving of it depends largely on the objects reliability that is defined by the extent to which internal and external factors may have the influence on. Any object consists of a set of components operating under appropriate technical parameters with each of them having its own range of deviation from the standard states. This range also called the tolerance zone is of great importance for seeking new criteria to evaluate the level of anthropogenic rick for both the object’s individual components and the object itself as a whole. At the same time the creation of the emergency protection system for the objects involves certain difficulties covering nondestructive control methods design and diagnostic means provision as well. The first thing to do is to reach a compromise between external devices (sensors, communication, infrastructure) mating and the object itself under control [1–3]. But the present well-known methods of control can’t provide complete safety. In the absence of extreme conditions the failure relating to the possible standard state parameter deviation is purely internal: it is built into the object components during their manufacturing, mounting and assembling and the operating conditions only add to the failure. The investigation of the statistical regularities mechanism for these processes is especially urgent for both the safety problem and the problem of keeping power-consuming and other objects safe from anthropogenic catastrophes during their usage. In any technical object unit one can specify a group or groups of interconnected and interdependent components whose parameters keep the object operating properly. Generally these components may not make the immediate contact with each other. Let’s name these or those components of an abstract unit conjugate for the sake of definiteness and as an example refer to the air engine’s two units: the body of the turbine and its rotor’s blades. Between the blades and the body of the turbine under operation there must be a process clearance to keep the turbine trouble free running. However the turbine units made with the certain precision has natural dispersion (spread) in sizes of both the body inner diameter and the blades length. These deviations may cause the minimum clearance between the moving and stationary parts of the turbine when the two events coincide simultaneously–the body inner diameter reaches the lower line of the tolerance and the blade length does the upper one. Let us mark that these deviations do not exceed the accepted allowable ones. However the probability of the turbine failure may increase under external factors influence leading to temperature, pressure and loads rise. This means that the object is in the area of risk. The performance of such analysis for the conjugate components with regard to their interconnection will allow defining the probability for destruction development potential risk and comparing it with the necessary (specified) level of trouble-free operating as well as develop an algorithm for the appropriate actions to provide safety. These probabilities, worked out for separate units (components) or the object as a whole are anthropogenic catastrophes criteria. A certain complexity of such approach lies in the relative uncertainty of unit (component) size deviation distribution from the average meaning in the tolerance field. Besides the standard normal distribution it makes sense to look at other possible probability distribution in this field. The uncertainty relating to the choice of limiting deviations range for the object mating components and the probability distribution density region width needed for its calculation may cause some difficulties. By analogy with the presented analysis of mechanical units operation one can consider electronic and other object units subject to failures whose parameters and characteristics also have statistical distribution. Let us next consider the most «problematic» mating unit components and evaluate the described situation leading to a failure probability increase. Let us consider the problem of an abstract object safety in the context of statistical regularities taking into consideration definitions and simplifications accepted. Let us also specify in this object (or separate unit) the conjugate components with the specified parameters for the operation in the standard state (each such component may have several parameters). The component parameters must be grouped as follows 1, 2,…, j,…, m (m 1) in each of them the conjugate components have numbers 1, 2,…, i,…, n (nj 2). For each group the events are represented by A1j, A2j,…, Aij,…, wherein conjugate components parameters deviations from the average ones are maximum and these events probabilities are p1j, p2j,…, pij,…, respectively. Fig. 1 To the definition of the critical state for two conjugate elements. When defining the probability one should take into account only those components (with the relevant probabilities pij) the events with which will cause the situation change for the worse (close to anthropogenic catastrophe). At the same time a consideration of the interrelation between several mating components at a time will demand far more complicated probabilistic models. This simple equation shows the most common nature of critical states for the unit or object independent parameters group. For the simple probabilistic model (see equations (1) and (2)) this value depends both on maximal probability deviation pij, maximum number of parameters for conjugate components nj and m-groups number. The probability obtained will be the most at . At sufficiently high values of m and q Pq,m is approximately defined according to Sterling equation. At small the Poisson equation  gives more accurate value. The approach based on average meanings pij allows evaluating the frequency of interest for the event q/m occurrence. With the increase of m the most real frequency of such event occurrence (the greatest statistical probability) will approach Pq,m In this case the probability that this frequency lying between and will approach the probability integral (Laplace theorem). But all looks much more complex if pij averaging is done not in a proper way. When considering the common case of Aij probability definition it is necessary to use the probability dense of a continuous random value. Let’s believe that x values are limited at the top and bottom by the elements aij and bij parameters (fig. 2), i.e. where is an absolute mean error of the parameter definition x (positive value). Fig. 2 Probability dense for the even accidental value. It’s well to bear in mind that error consideration broadens the range of limiting parameters by the value of 2 . At the same time for the units with the specified standard tolerable errors for parameter measurements at acceptance check out the limiting parameter boundaries according to the standard include these errors (see, for example, ). In these cases the limiting boundaries of the relevant parameters are fixed and must not be changed (fig. 3) and that is especially important for highly accurate unit components. 1–even distribution; 2– normal distribution law. allows to simplify the probability calculations P and Pq,m . While using the probability nonsymmetrical probability density or in particular at Gauss distribution when the field tolerance boundaries are nonsymmetrical relative to Mij mode, the elements of the matrix should be determined by the method described in . The event probability Pq,m may accordingly be calculated based on the above given relations (4) and (11). Similar transformations are done for the rest of equations. The greater the probability values in these equations the higher the failure risk for the unit or the whole object considered. The critical values obtained for these probabilities appropriate to the extremes of the allowable interval parameters are named limiting probabilities. The conjugate component parameter number increase for the nj unit (group) causes to decrease sharply (the events at pij<<1 are considered). Performing the addition of the probabilities the contribution of this component might be insignificant. That is why it makes sense to specify two groups with the same number of mating component parameters nj (nj = 2, 3,…) to which critical state probabilities (2), (3),…, are appropriate and compare them in between. Limiting probabilities under these conditions are critical states levels – the first, the second and so on respectively. The same is also relevant to the total probability risks notion introduced below. Solving the problem of evaluation of complex system high degree failure risk one can face the difficulties when building separate group parameter probabilistic models. It is worthwhile making up these groups (subsets) into bigger ones (sets) with the appropriate probabilistic models. The events described at the object operation occur undeniably and are of interest, however are very seldom. In the real life all is more complicated. However besides the above mentioned critical states one should refer to the cases when the unfavorable coincidences of the conjugate element parameters deviation from the average including the parameter vicinity cij of the length considered (aij; bij) and as far as to the point of its middle (mathematical expectation ij) take place. So, consideration must be given to the introduction of a weigh function under the integral sign multiplied by the probability density (x), which allows for the degree of approximation to the tolerable parameter intervals extremes (limiting probabilities), fig. 4.
where for a simple probabilistic model (1) . At the fixed parameter boundaries with the upper limit in the equation numerators (27) and (28) is replaced by cij while the integration limits in the denominator are replaced by aij and bij, respectively. The main drawback of the limiting probabilities considered is that they are generally defined by the error the value of which is chosen conventionally enough: the measuring instrument error may change in the wide range of limits. Another approach to the problem of total risk probability gives the opportunity to predict the discussed unit or object failure independently from the error values if the tolerance boundaries are fixed. The complexity is that the weight function degree (26) is unknown. With is a linear function not showing the true situation. If the total risk probability approaches 0. Complex investigation of a big amount of statistical data may give more or less exact situation, unfortunately the authors of the paper don’t know about them. At the present stage another thing is important. Speaking about the comparison of an anthropogenic catastrophe criteria obtained for different units of one and the same object/objects that will be enough to consider k as the same value for these cases and make it equal 3 (cubic parabola) that sketches true situation. When conducting further investigations this value may be adjusted and the results refined. Potential risk probabilities calculation even for the simplest case of independent events is a rather difficult problem. Let us specify these values for a simple specific case where the events have pure mechanical nature, a bearing, for example, that is the unit of an abstract object and research the influence of different factors on it related to its manufacturing, accuracy measurement, accuracy rating and probability density type. To evaluate potential probability risk let us consider a radial roller bearing having a short cylindrical 2000 type roller, fig. 5 . Let’s also assume the following system of mating for the bearing conjugate components: transition mating into the body opening and stressed one on the shaft. At last let’s specify 3 parameter groups for the conjugate components (m = 3): the opening diameter 1 – the outer diameter of the outer ring 2 (j =1); the outer rolling way diameter 2 – the roller diameter 3 – the inner ring rolling way diameter 4 (j =2); the inner ring inner diameter 4 – the shaft diameter 5 (j =3). You can find the bearing components, opening and shaft dimension tolerances  in table 1 and the data necessary for doing calculations in accordance to the above said their presentation structure – in table 2. The definition accuracy of geometric parameters ,in general is determined by accuracy rating specified for this unit. Errors presented by the matrix are accepted as equal to the allowable ones under the State Standard  at the acceptance test. 3 – the cylindrical roller; 4 – the inner ring; 5 – the shaft. Table 1 The bearing conjugate components tolerance field. Table 2 Data for calculation, =5 ( ). Using the equations obtained the necessary calculations have been done for limiting and total risk probabilities for both even and normal distributions. The calculation algorithm developed for the fixed limiting tolerance field boundaries for the discussed mechanical unit was realized in Mathcad medium. Some results of these calculations are given in table 3 and figures 6 – 9. The discussion of the results gained is carried out below. Table 3 Some calculation results for the mechanical unit ( =5, k = 3). under the normal distribution rises approaching its limiting value i.e., the probability under the even distribution (fig. 7). In fig. 8 the influence on potential risk probability index k, which is the most essential at k < 2÷4 has been shown. Fig. 7 Total risk probability dependence of the root- mean- square deviation ( = 5, k=3). It makes also sense to investigate the influence of the measurement instrumental error on the results of the calculations in the limits of accuracy rating chosen: . According to the calculations if decrease up to 0,5…1 µm the relative probabilities P and differ little from each other. dependence of the k parameter ( =5). Fig. 9 Total risk probability dependence of accuracy rating (k = 3). The dependence of the obtained potential risk probabilities of the unit accuracy rating is shown in fig. 9. Going to higher accuracy rating ( decrease) followed by the tolerance field narrowing does not at all mean that the potential risk probability must go down: the unit conjugate components critical states probabilities at least for the fixed tolerance field boundaries go up (the denominators of the appropriate equation fractions decrease). The Le Chatelier – Brown (1884) approach may be arranged for the problem specified. That means that the unit accuracy rating increase involving the limiting parameters boundaries narrowing and thus providing its reliability in service causes the system state under which the stimulated processes lead to the system reliability decrease. However the result gained does not actually mean that the accuracy rating increase necessarily lead to the object reliability decrease which is determined not only by the considered criteria expressed through the laws of probability. It may be explained by pure inner conflicts, unique to each technical object: for the units with high accuracy rating one can expect conjugate components critical states events more often than for the units with wide tolerance fields. The example considered shows that the offered approach to the problem of technical safety can be used for the evaluation of the anthropogenic catastrophe risk for the objects of different purposes. At the same time, it is quiet clear that in real conditions the concept of independent events does not fully cover the processes reviewed. In many modern overloaded technical objects together with mechanical processes other processes such as thermodynamic, electro dynamic, chemical and other ones are taking place. Their interrelated running makes the existing private evaluation strength methods doubtful and especially if it concerns the life of such objects. One of the examples of such objects as the least reliable from the point of view of reliability are bearing between two rotors for gas-turbine engines operating between two quickly rotatable vibrating rotors surrounded by close open flame separated by a rather thin current-conducting low-magnetic sheaths and air-gas films. Under these conditions the bearing destruction event is as a rule random, sudden and quick. 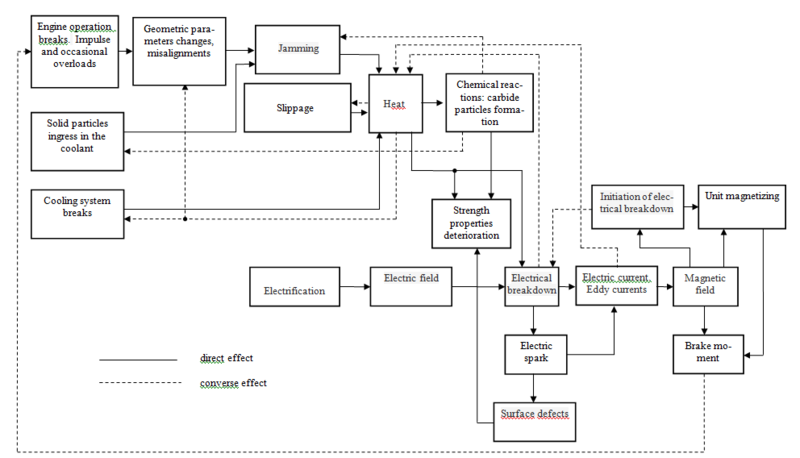 The physics of the process is not clear and the methods for the complex evaluation of the influence of different by its nature factors do not exist (fig. 10). It has been shown that at the statistical parameters dispersion defining a technical object operation within the limits not exceeding the tolerance field of the relevant accuracy rating under normal operating conditions and manufacturing and staff error absence, the object as a whole with the certain event probability appear to be in the group of risk without regard to operating qualities, its state and environment. The reasons for the event indicated are referred to the inner nature and related to only final components or units manufacturing accuracy, their assembling and mounting as well as natural parameters and characteristic dispersion. During the object operation these parameters may go far beyond the tolerance field that will add to failure probability. To avoid these events it makes sense to carry out parameter control of the components and units that are less reliable in number of failures at regular intervals. A change to higher accuracy rating involving tolerance field narrowing at least for their fixed boundaries under normal probability density distribution may lead to unit probability potential risk rise, the reason of which is the increase of the unit conjugate component critical state probabilities. -total risk probability independent of these errors at least for the fixed tolerance field boundaries. Fig. 10 To the definition of the air engine bearing destruction mechanisms. The calculation of these values allows evaluating the potential risk probability for both separate units and the object as a whole. The failure forecast will make it possible to provide certain safety measures and particularly to create emergency protection means based on innovative technologies to provide the unit with global technical safety. It makes sense further to consider a more detailed description of object components and units interconnection based on hypotheses concept, multivariate probability distributions, mathematical statistics modern methods as well as other approaches. Лозовский В.Н., Бондал Г.В., Каксис А.О., Колтунов А.Е. Диагностика авиационных двигателей. Москва: Машиностроение, 1988. Korshakovsky S.I., Krasnenkov M. A. Test Technology of Moving Electric Conductive Component Defects //10th International Trade Fair and Conference, May 8 10, 2001, Exhibition Centre Nurenberg, Germany //MAT-2001 Proceedings, p. 359 362.
контроль и диагностика // Справочник под ред. Клюева В.В. Москва: Машиностроение, 2003. Шторм Р. Теория вероятностей. Математическая статистика. Статистический контроль качества. Пер. с нем. Под ред. Райтмана Н.С. Москва: Мир, 1970. Вентцель Е.С. Теория вероятностей. Москва: Высшая школа, 2006. ГОСТ 8.051 81. Москва: Издательство стандартов, 1987. Подшипники качения/Справочник-каталог. Москва: Машиностроение, 1997, 896с. Анурьев В.И. Справочник конструктора-машиностроителя, т. 1, 2. Москва: Машиностроение, 2001.